Applying the Board filter allows you to locate cards per board and filter out the information which is relevant to your search. 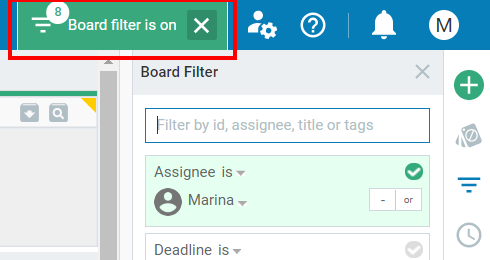 To apply the board filter -> click on the Board filter icon located on the Sidebar to the right of your board interface. 2. How to make use of the board filter? The Board Filter feature is a sideboard panel that works per board. 2.1 Use the different components in the panel to switch on and off the criteria for showing the cards on the board. For example: if you filter your board by an Assignee -> only cards assigned to the specified user will be displayed on the board. To enable a filter, activate the green checkmark to the right of its name. The enabled criteria are colored in green. You can use the "or" button to add a second property that belongs to the same criteria. To remove the additional value click on the minus sign. 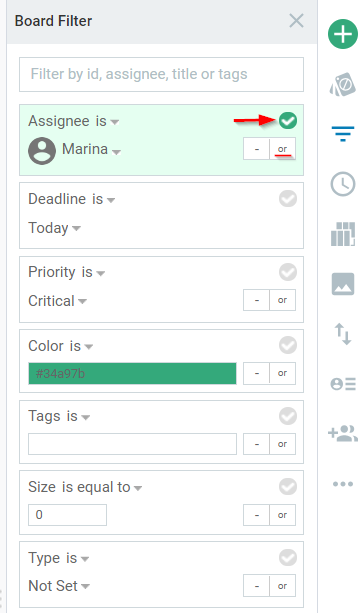 For example: if you set up an assignee: Marina - the feature will filter out all cards on the board and only Marina's cards will be made visible. Use "оr" to add a second name from the dropdown list: e.g. Oliver -> the system will filter out and display all cards assigned to both Marina and Oliver. Custom Fields: If you have added custom fields to your board, they will be also available as filter criteria in your board filter (e.g. "2nd Contributor", "Last Modified", custom fields from type "Dropdown", etc.). Note: When the board filter is active a text with the results framed in green appears on the top right side of your board. It displays the number of cards matching your search. 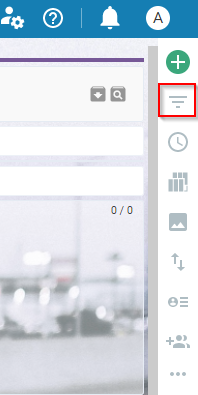 Click on "x" to restore the default board view. With the Board Filter feature you can perform a quick search for a card by ID; assignee; title or a tag. Just fill in any of the criteria in the search field and the board will be filtered instantly while you are writing. 3. How to save your Board filter? Users can save board filters in order to quickly load them again when needed. 3.1 Configure your filter and click on Save at the bottom of the panel (1) -> then enter your Filter name (2) and Save the Filter (3). 4. How to load/edit/delete a board filter? 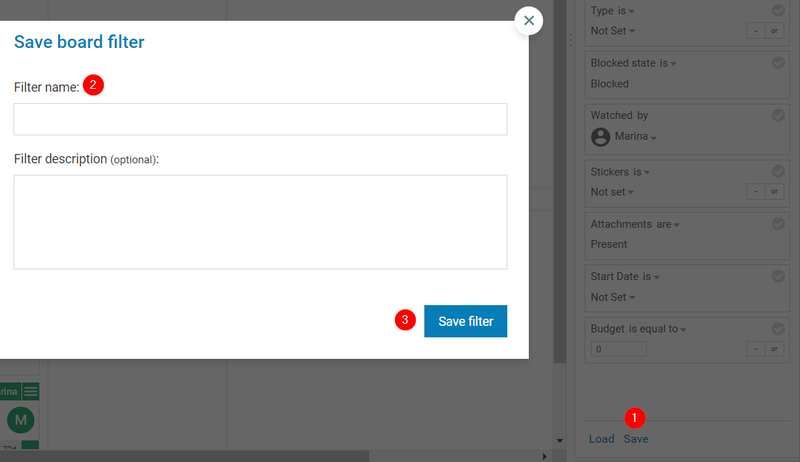 To apply a filter that you have saved - click on the Load (1) icon at the bottom of the Board filter panel and select the corresponding filter name.